Boats are out on the LSW. Submitted by Elaine Gray. 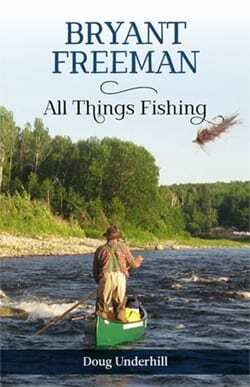 MIRAMICHI – IT’S THE TURNING OF A PAGE SEASON. Spring or black salmon are basically finished except for the very odd straggler. Bright salmon and sea trout are starting into the system, and the numbers of striped bass being caught are gradually increasing as the water warms a bit. The 2017 Miramichi Striper Cup and the Miramichi Rotary Ribfest take place this Friday to Sunday at Ritchie Wharf in Newcastle, Miramichi. The “shot-gun start” for bass boats is 9 am Saturday. W. W. Doak and Sons in Doaktown said the black salmon are pretty gone, and there are no brights yet, but any day now they could start to filter into the system. There are some river or black trout and a few bright sea trout starting to be caught. Basically it is an in-between season there with not a lot of anglers out. The water is a good height and still on the cool side, which had prolonged the spring season, making it one of the better ones recently. Flies of choice were Muddlers, Woolly Buggers, Black Ghosts, Butterflies, White-tailed Green Machines and some spring streamers tied on smaller hooks such as nos. 4 & 6 hooks. Great long weekend out on the water when my soon to be 3 year old son Jase reeled in his first bass! He loved to come fishing before but now he’s hooked for life! Submitted by Matthew Gregan. Andrew Anthony of Ledges Inn in Doaktown and Mountain Channel in the Rapids area said spring salmon season was over with only an odd one maybe being hooked in the lower part of the river such as at Mountain Channel. No bright salmon have been hooked yet, but anglers were getting some trout including some bright sea trout. The water is in good shape with spring pools starting to take shape, and the fiddleheads are up and ready for picking. Flies of choice were White-tailed Green Machines, Glitter Bears, Black Ghosts and Shady Ladies. Herb Barry Sr. of Herb’s Fly Shop on the Station Road in Blackville said angling there was quiet with only a few trout being hooked, including a few sea trout. Some of the river trout were in the five-pound range. Black salmon were gone and there were no reports of brights yet. 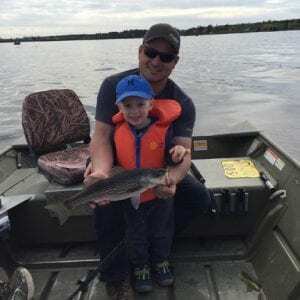 Herb and his son were catching some nice striped bass in the city of Miramichi area. Flies of choice were Muddlers and smaller Renous Specials and Mickey Finns. Bass were taking some home-made jigs with feathers and a lot of Krystal Flash. 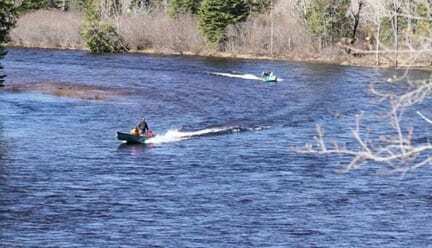 Curtis Miramichi River Outfitting in Blackville said angling was quiet except for an odd spring salmon and a few trout, some of which were sea-run. There were no bright salmon reported yet and not a lot of anglers on the river during this in-between season. The water was a good level for boats and especially canoes. Curtis Miramichi Outfitters are running a fly-casting school on Saturday, May 27 from 8:30 am to 4 pm. Cost is $95.00. Call 1-506-843-2481. Flies of choice were Muddlers and Black Ghosts. Jim Laws of Miramichi Hunting and Fishing in Newcastle, Miramichi reported the end of spring salmon, but no bright ones yet. Anglers were picking up some big trout in the 24-inch range (four to five pounds), but very few smaller trout. Striped bass numbers were increasing and the weekend should be good for the Miramichi Striper Cup this weekend. Flies of choice were Black Ghosts, Green Machines and Butterflies. A doe taking her yearling across the river. Submitted by Elaine Gray. Syd Matchett of Trout Brook Fly Shop on the Northwest Miramichi said the bright salmon had started as Doug Best had hooked two, losing one at Wayerton Bridge on Wednesday May 24. Prior to that, angling had been quiet with only a few parr and smolt reported. Both the spring salmon and smelts were gone, but striped bass fishing was good with some big ones being hooked below the Red Bank Bridge. Flies of choice were Yellow Butterflies, Cossebooms, Black Ghosts and Green Machines. 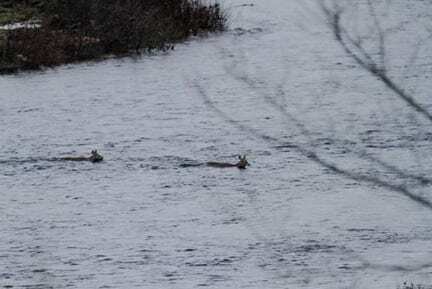 Debbie Norton of Upper Oxbow Outdoor Adventures on the Little Southwest Miramichi said spring salmon were done and no brights had been reported yet, but she expected them any day. The water was falling and it was difficult to run a motor boat without being very careful. She had heard of a five-pound trout in the tideway. Striped bass fishing was good with a 41 ½ incher caught by Paul Elson Jr. There were also a lot of 36 inchers being hooked as well. The smolt migration was just about complete. Smolts had also been collected for the Smolts to Adults Rearing Program at the hatchery. Two cameras have been installed at Blackville to count fish, and another will be installed on the Little Southwest Miramichi. Flies of choice were Black Ghosts, Butterflies and Muddlers (trout). So with the bright salmon starting, some sea trout on the move and increased striper activity increasing, it is time to get out and “on the water”. Finally the water levels on rivers in the Maritimes and Gaspé are dropping and ASF is able to tag fish for this year’s salmon tracking programs. Watch Graham Chafe release a Restigouche kelt to continue its migration in a 48 sec. video. The year 2017 will be remembered for a long time by ASF’s researchers for the high water levels that have added great difficulty to the field work. Read one researcher’s account of this. ASF gave this year’s T.B. ‘Happy’ Fraser award to the Fundy Baykeeper program, and it was accepted by Matt Abbott at an ASF gala dinner in St. Andrews. On June 7 ASF begins a study designed to provide greatly improved fish passage. A new study has confirmed the major impact that sea lice can have on the return of wild Atlantic salmon. While the issue is greater in the eastern Atlantic at this time, it is still a problem in eastern North America. This is a syndicated post. You can view the original post here: Miramichi Fishing Report for Thursday, May 25, 2017.